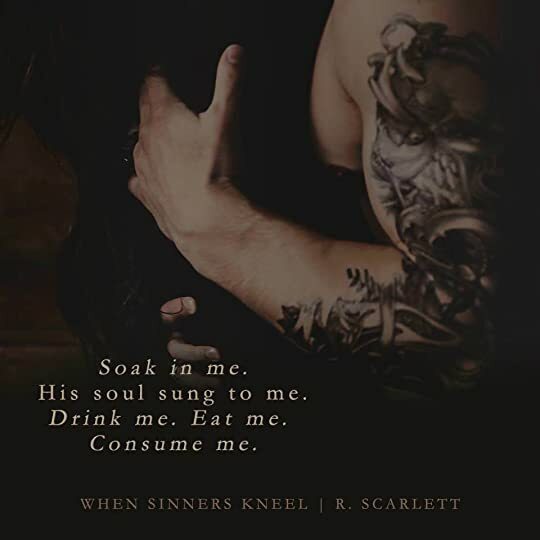 ARC Review: WHEN SINNERS KNEEL by R. Scarlett | The Biblioholic ~ Read more. Sleep less. 5 “Let me save your soul” stars!! And let us not forget Lex! This young woman simply amazed me with her goodness. The connection she shared with Beau was fearless in the face of almost certain devastation. She knew the darkness and shadow that filled his soul and she wanted to heal him. After everything she had been through, the atrocities she had suffered, and this woman still found hope and the value of love. Honestly, this story really touched me, in ways that I couldn’t have predicted. I almost cried, which is an incredible feat to achieve. But I also smiled so much because the evolution of Beau was an awesome thing to witness. I’ve craved his story from his first mention through Tensley and I’m so happy to have gotten the chance to really meet him. I’m both honored and humbled. I cannot wait to see what other stories this series will bring. I’m hoping for some Illya one day and I’m definitely looking forward to the Prince of the High Court! Whoa, this book sounds really good. I've heard so much about it already. Do I need to read the Blackest Gold series before starting this?